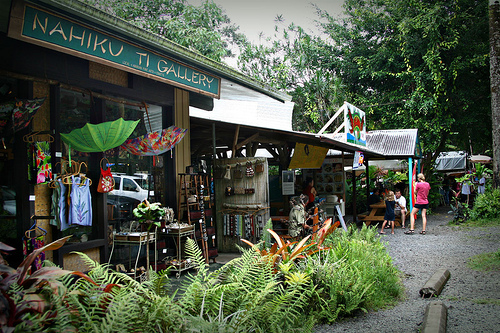 Just six miles before Hāna Town, (near mile marker 29), you’ll find the Nahiku Marketplace. Over the past nine years or so, the Nahiku Marketplace has transitioned from a couple of local vendors to a mini-village of tropical delights. This is a great place to stop on your way to Hāna to grab a bite to eat; refresh with fresh coconut water, juices or coffee, and browse a great selection of locally made souvenirs. You can also find yummy coconut shrimp, smoked fish, homemade coconut candy (original, spicy and lavender) and baked ‘ulu (breadfruit)–so delicious! At the Nahiku Marketplace, guests can also find a variety of locally made gifts, including rare shell and semiprecious stone jewelry, spiritual icons, woven goods, woodwork, glass art, surf art, Maui-made tropical home decor items, local artist paintings and more. This is a must-do on the road to Hāna. You never know what you’ll find here! 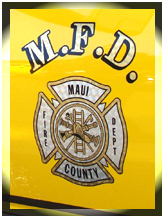 Is it safe to say that the Nahiku Marketplace is open 9 a.m. to 5 p.m. daily? Well, it really depends. Sorry–island time! For more information about the Nahiku Marketplace, go online. 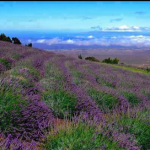 Over 25,000 rubber trees were planted in Nahiku in 1905 by the Nahiku Rubber Company. Although tree growth was more than abundant, the company never took off because of the isolated location and production issues.